"Dallas police Officer Amber Guyger, who fatally shot 26-year-old Botham Jean in his Cedars apartment, was fired Monday." I'm not sure I have a problem with that even though, like I've said, I don't think there is a criminal offense here. Nevertheless, I don't think you can have an officer on the force who made such a tragic mistake. There was a murder arrest in Wise County last week and, in another incident, a guy got arrested for Agg Assault in Decatur where the alleged victim was in critical condition at JPS. At first, they weren't sure he was going to survive. That would have been two murder charges in Wise County within a week. Hal Jay on WBAP this morning: "That interview didn't count." His bubba co-workers were in shock. I used to think the Cowboys were getting a great deal by only having to pay Dak Prescott what he is due from his small rookie contract. Turns out, they may only be paying him what he is worth. One of the strangest aspects of the Kavanaugh story is his yearbook from that high tone prep school that he attended. The whole publication appears to have been edited by students without any faculty oversight whatsoever with references to beer drinking and partying scattered throughout. For example, he was "Treasurer" of the "Keg City Club." 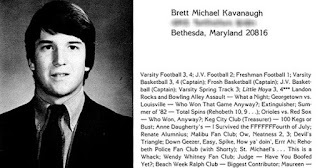 But someone noticed that at least 13 male students, including Kavanaugh, made reference to being a “Renate Alumni” or "Renate Alumnius". What the heck did that mean? The New York Times figured it out: "It is a reference to Renate Schroeder, then a student at a nearby Catholic girls’ school." You get the idea. Oh, my! Here's a group photo with the shocking "Renate Alumni" reference underneath it. Kavanaugh is pictured next to Mark Judge, the man who allegedly was in the room during the alleged assault of Dr. Ford. Everyone of those guys from Georgetown Preparatory School remind me of James Spader's character in Pretty in Pink. 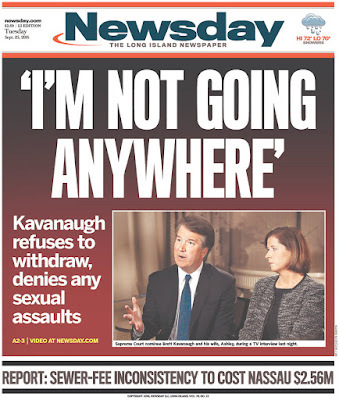 I had forgotten that when Kavanaugh was first introduced by Trump that he fired off this big lie right off the bat: "No president has ever consulted more widely or talked to more people from more backgrounds to seek input for a Supreme Court nomination." I still think this cop will be found not guilty. There is a rash of college players walking away from their teams. Oklahoma State's leading receiver from last year announced he would transfer since he doesn't like the way he was being used this year. It's the new, "Play me or I'm leaving" mentality. Baylor had it happen last week. Arkansas had one yesterday, too. Ted Cruz got harassed out of a D.C. restaurant. (Video.) I want to feel badly for him but I just can't. Sports Illustrated has a story (which takes half a day to load) about the new atmosphere at UT football games. It included a video which included a gal who just happened to have two flasks. Anyone could walk into a baseball dugout with no other coaches and with no notice and still lead a major league team to a victory. "Guys, just go play ball." Get thrown onto a football sideline with no other coaches and tell your team, "Guys, just go play ball" and you'd get slaughtered.